If you were lucky enough to have a pal or relative working in one of the many cinemas or picture houses around Dublin they would sometimes give you a free pass into the pictures. One friend of mine had a sister that worked as an usherette in the Carlton Cinema in O’Connell Street. She would often give us a free pass each or sometimes she’d just sneak us in and bring us up to the balcony. I think that the cinema staff may have been given a certain amount of free passes every month or something like that. I remember in the 1970’s there was a bomb scare in the Savoy Cinema and as everyone was leaving the building they were given a free pass for another night. The curtains closed over as the lights came on and the manager walked out onto the stage to make the announcement about the scare. 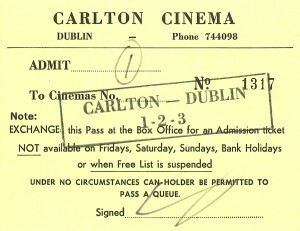 The Da’ often had free passes for the Deluxe Cinema in Camden Street where he worked in the bank next door. Every Friday night himself and the Ma’ would get all dolled up and take the 22 bus straight over to Camden Street from the lower end of Carnlough Road. You don’t see many Free Passes into anywhere these days.